Hey, it's OK to dream a little. I know you might be in a church situation where there does not seem to be much happening, maybe you are the only musician, but dreaming big is often the start of moving towards your destiny. I have been in many situations throughout life where there's been a lack of personnel (or at least the right personnel), and when I've started to dream and ask God, suddenly the right people have come in. I do not believe it is wishful thinking, but rather it is allowing God to direct your dream and vision for the future, and letting Him shape your worship team. Many times people have the abilities you need, and they are hiding in plain sight! As you dream and believe God for something awesome, as you pray and seek His will for your worship team, then you can start to see the kind of players and singers you want coming your way! So we wanted to start this brand New Year with an encouragement to step back, have a good long look at your band and singers, and start dreaming of the right and suitably gifted people the Lord is going to bring into your church. It costs nothing to have a vision for the future of your ministry, but that vision could be the very thing that drives you and sustains you into what the Lord has for your ministry, and your worship leading. This is 12 minutes that you can invest right now that might make a difference for your entire year, so check it out now... If you are looking for ways to learn how to lead worship in three easy steps then this could be one of the most important articles you've ever read. Leading worship in church is a responsible and respected position, but many times people who are inexperienced are thrown into the job, even though they do not know how to lead worship effectively. So here are a few points on how to lead worship powerfully and effectively, especially if you are inexperienced. The first step in learning how to lead is to prepare your material thoughtfully, carefully and most importantly prayerfully. I cannot emphasize this point enough: if you want to learn how to lead worship in a powerful way that is well received by your audience, you must select your material carefully. The best praise and worship songs to use, especially when you are learning how to lead praise and worship, are ones that people are familiar with. This will of course very from church to church, but there are a number of great “standards” that people know and love and will immediately respond to. Great praise and worship hymns such as “I Surrender All”, “How Great Thou Art” and “Great Is Thy Faithfulness” are often sure fire ways two great worship times, as are more modern songs such as “Shout to the Lord” or “How Great Is Our God.” The thing to remember when you were learning is that praise and worship leading is more about your audience than it is about your preferences. One of the biggest mistakes those learning how to lead make is they choose songs they liked that the congregation is unfamiliar with. If you want to make a great impression lead worship with anointing and great favor, select songs that everybody knows! If you are starting out, you need to prepare your worship team so that they are 100% with you and supportive of what you were doing. You need to spend time with them not only practicing and playing, but also enjoying coffee and laughs as you build a relationship that will be transferred into your praise and worship leading. Make sure you spend time preparing your team in prayer, and also explaining to them why you were doing certain songs in the order you have chosen. As you arrange the songs, try to include their ideas because there is great power in unity, and if you are learning you must also be learning how to lead men and women. The third area of learning how to lead worship is to prepare your own heart. You need to spend time with the Lord if you are going to lead others into his presence, and that includes prayer and devotions, reading the word of God and seeking him as to which songs he wants to use in the worship time. Of all the areas of preparation, if you are learning how to lead worship the most important is to prepare your own heart. If you have seen in your life, confess it and get it out of the way. If you have distractions in your life, deal with them and make sure they do not interfere with your mind or your heart as you come to lead worship. I believe that if you take these three simple steps to heart, you will learn how to lead praise and worship in a powerful and effective way for your congregation. Remember, you are not just learning how to do it but you are learning how to lead your team, prepare your hearts and direct your audience into a greater worship experience. So when you have the opportunity, don't just stand up and sing a series of songs but learn how to lead worship in a powerful, anointed and effective way.Worship Team Training is a far more complex role than most worship leaders realize! They start off thinking that all they have to do is sing and the rest will follow, but over the years I have learned many things about worship team training and handling my musicians and singers. In creating and working with different worship teams I have also made hundreds of mistakes, most if which I do not want you to make when you are worship team training. I would like to share with you a couple of things I've been taught, in the hope that you'll be able to duck these little bumps along your own journey. Worship leading needs to be a passion for the worship leader, but for most of your band and singers and that is why worship team training is so essential. However, you may be dispirited to find that they are not as passionate as you when it comes to your worship leading! We must not forget the members of the worship groups are volunteers. I know there are some churches that have paid musicians and singers but ninety percent of us have volunteers. In that we must remember that while we must have a group of basic rules of our teams, we mustn't be harsh in our worship leading policies. Here is what I mean by that. If your rules are too strict and or they are too controlling you will have trouble keeping volunteers, no matter how good your worship team training or how big the church. This is a mistake that I made early on and soon found out very quickly that a volunteers heart is to serve not be proscribed by a handful of rules. As I recall scripture has something to say about rules that are too stern. Are we going to act like Pharisees, or are we going to stand up and act like true worship leaders! The best leaders lead by motivation, not by orders and rules. If you want the very best from your worship team training, become a worship leader of the highest order, and inspire the adulation and devotion of those you lead in your Worship Leading ministry. Another point to consider is that we have got to be open to changing to the requirements of the team. Remember this is a worship leading ministry. For instance, say your drummer just got a new job. And part of that job needs him to take some night classes. He still wants to be on the team but his classes happen to be on the booked walk through nights. He knows that he must rehearse as part of your worship team training to be on the team. What do you do? Simply ask the remainder of the team if there is another night or time that they could meet. Almost all of the time you will be able to work something out for your worship team training. I have done this for many different situations. Whether it be childcare or job related or what ever. The point is this is a Worship Leading ministry. Adapt to the requirements of the people as long as it will not hinder or affect the worship team training or dynamics in a negative way. 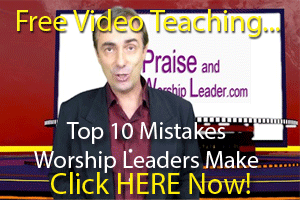 Another common mistake many worship leaders is making worship team training too structured. Yes you want the band to be musically tight. And you have new songs you want to work on. But make sure you have fun too. Often the team just wants to fellowship awhile before worship team training or before you rehearse. Often you might want to jam together on a good chord progression for fun. As an important point I can see these jam sessions making the musicians tighter. Again, helping your team enjoy worship team training and rehearsal is a key to having great dynamics within your team. We must never forget that. People must come before music. Don't only get together for worship team training, rehearsals and the service. Do not simply rehearse and serve together, you need to play together also. Have parties. Go on barbecues. Have a games night or go out together. Simply put, have fun together away from the band setting and away from worship team training. Fellowship together. This is a superb way to get to know one another and to build friendships and trust. Remember, all work and no play will make the singers and musicians stay away. There is more to worship leading than worship team training, rehearsals and the service! If you are looking for ways to learn how to lead worship in three easy steps then this could be one of the most important articles you’ve ever read. Leading worship in church is a responsible and respected position, but many times people who are inexperienced are thrown into the job, even though they do not know how to lead worship effectively. So here are a few points on how to lead worship powerfully and effectively, especially if you are inexperienced. The first step in learning how to lead is to prepare your material thoughtfully, carefully and most importantly prayerfully. I cannot emphasize this point enough: if you want to learn how to lead worship in a powerful way that is well received by your audience, you must select your material carefully. The thing to remember when you were learning is that praise and worship leading is more about your audience than it is about your preferences. One of the biggest mistakes those learning how to lead make is they choose songs they liked that the congregation is unfamiliar with. If you want to make a great impression lead worship with anointing and great favor, select songs that everybody knows! If you are starting out, you need to prepare your worship team so that they are 100% with you and supportive of what you were doing. You need to spend time with them not only practicing and playing, but also enjoying coffee and laughs as you build a relationship that will be transferred into your praise and worship leading. Make sure you spend time preparing your team in prayer, and also explaining to them why you were doing certain songs in the order you have chosen. As you arrange the songs, try to include their ideas because there is great power in unity, and if you are learning you must also be learning how to lead men and women. The third area of learning how to lead worship is to prepare your own heart. You need to spend time with the Lord if you are going to lead others into his presence, and that includes prayer and devotions, reading the word of God and seeking him as to which songs he wants to use in the worship time. Of all the areas of preparation, if you are learning how to lead worship the most important is to prepare your own heart. If you have seen in your life, confess it and get it out of the way. If you have distractions in your life, deal with them and make sure they do not interfere with your mind or your heart as you come to lead worship. I believe that if you take these three simple steps to heart, you will learn how to lead praise and worship in a powerful and effective way for your congregation. Remember, you are not just learning how to do it but you are learning how to lead your team, prepare your hearts and direct your audience into a greater worship experience. So when you have the opportunity, don’t just stand up and sing a series of songs but learn how to lead worship in a powerful, anointed and effective way. Worship Team Training is a far more complex role than most worship leaders realize! They start off thinking that all they have to do is sing and the rest will follow, but over the years I have learned many things about worship team training and handling my musicians and singers. In creating and working with different worship teams I have also made hundreds of mistakes, most if which I do not want you to make when you are worship team training. I would like to share with you a couple of things I’ve been taught, in the hope that you’ll be able to duck these little bumps along your own journey. Worship leading needs to be a passion for the worship leader, but for most of your band and singers and that is why worship team training is so essential. However, you may be dispirited to find that they are not as passionate as you when it comes to your worship leading! We must not forget the members of the worship groups are volunteers. I know there are some churches that have paid musicians and singers but ninety percent of us have volunteers. In that we must remember that while we must have a group of basic rules of our teams, we mustn’t be harsh in our worship leading policies. Here is what I mean by that. If your rules are too strict and or they are too controlling you will have trouble keeping volunteers, no matter how good your worship team training or how big the church. This is a mistake that I made early on and soon found out very quickly that a volunteers heart is to serve not be proscribed by a handful of rules. As I recall scripture has something to say about rules that are too stern. Are we going to act like Pharisees, or are we going to stand up and act like true worship leaders! The best leaders lead by motivation, not by orders and rules. If you want the very best from your worship team training, become a worship leader of the highest order, and inspire the adulation and devotion of those you lead in your Worship Leading ministry. Another point to consider is that we have got to be open to changing to the requirements of the team. Remember this is a worship leading ministry. For instance, say your drummer just got a new job. And part of that job needs him to take some night classes. He still wants to be on the team but his classes happen to be on the booked walk through nights. He knows that he must rehearse as part of your worship team training to be on the team. What do you do? Simply ask the remainder of the team if there is another night or time that they could meet. Almost all of the time you will be able to work something out for your worship team training. I have done this for many different situations. Whether it be childcare or job related or what ever. The point is this is a Worship Leading ministry. Adapt to the requirements of the people as long as it will not hinder or affect the worship team training or dynamics in a negative way. Another common mistake many worship leaders is making worship team training too structured. Yes you want the band to be musically tight. And you have new songs you want to work on. But make sure you have fun too. Often the team just wants to fellowship awhile before worship team training or before you rehearse. Often you might want to jam together on a good chord progression for fun. As an important point I can see these jam sessions making the musicians tighter. Again, helping your team enjoy worship team training and rehearsal is a key to having great dynamics within your team. We must never forget that. People must come before music. Don’t only get together for worship team training, rehearsals and the service. Do not simply rehearse and serve together, you need to play together also. Have parties. Go on barbecues. Have a games night or go out together. Simply put, have fun together away from the band setting and away from worship team training. Fellowship together. This is a superb way to get to know one another and to build friendships and trust. Remember, all work and no play will make the singers and musicians stay away. There is more to worship leading than worship team training, rehearsals and the service!